PC Granules increases the germination percentage when applied at the time of sowing. Gives fast and even germination. PC Granules increases the germination percentage when applied at the time of sowing. PC Granules helps strong and stout initial growth of plant. Use of P.C. Granules causes profuse rooting and there by increases the nutrient uptake. Improves soil structure, water retaining capacity and proper aeration. Helps plant to withstand stress conditions. Helps to maintain the soil fertility and productivity. 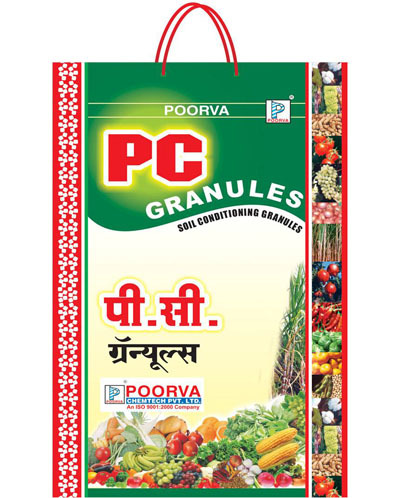 PC Granules induces healthy and rapid plant growth and thus increases the yield. It keeps root system in healthy condition. PC Granules helps in efficient and optimum use of different nutrients that are applied externally as well as already present in the soil. Thus PC Granules results in healthy and strong crop growth, increased yield and thereby increasing returns to the farmers. Application: Applied at the time of sowing or transplanting of the seedlings. It can be applied with manures or fertilizers at the time of top dressing split application at the time of sowing and top dressing gives best results.